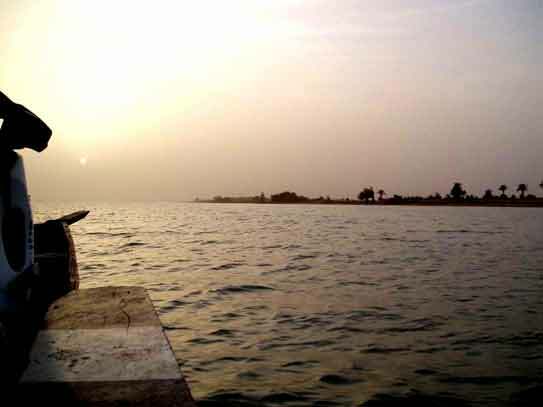 "On 20 April (1828), at sunset, I entered Tomboctou the mysterious and I could hardly contain my joy. My idea of the city's grandeur and wealth did not correspond with the mass of mud houses, surrounded by arid plains of jaundiced white sand, which I found before my eyes." So recorded Rene Caillie, the first European to return from Timbuktu to write about it, though not the first to 'discover' the city, that honour lies with the Scotsman Gordon Laing who travelled south from Tripoli through the Sahara, almost dying in an attack on the way, eventually ambushed and killed shortly after leaving. The forbidden city, rumoured to be the main trading city for African gold, was a source of legend for centuries. Joseph Banks, the renowned naturalist who had been on Captain Cook's journeys, hoped the glory of the ancient world might be rediscovered in Timbuktu's thriving markets, well endowed libraries, magnificent court and luxurious palaces. The Africa Association was set up in London at the end of the eighteenth century by Banks with the intention of filling in the blanks in the map of North and West Africa. 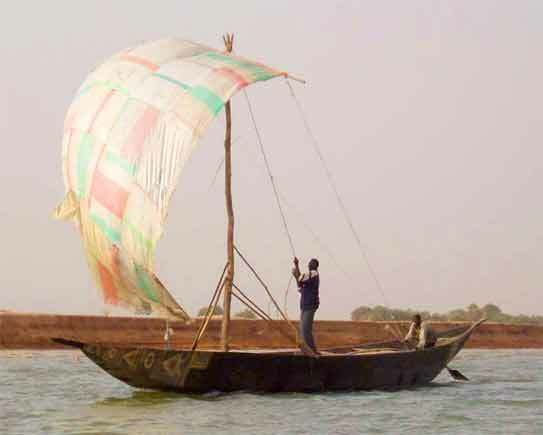 The direction of the Niger River and where it ended was still unknown, speculation varied for many years that it flowed east to west (it doesn't), that it disappeared into the Sahara desert (possibly into Lake Chad), that it was the source of the Nile, or that it flowed into the Congo River. 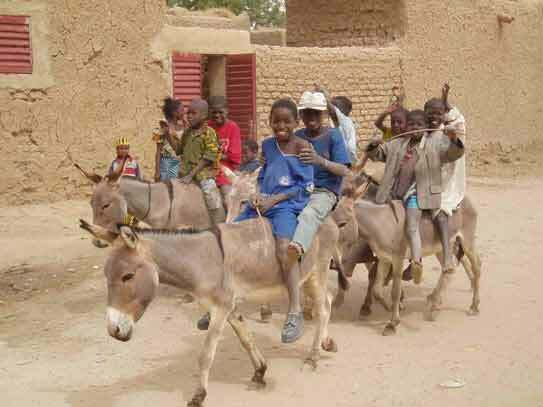 The Association's wish was above all to reach the mysterious Timbuktu and open trade routes via the Atlantic ports in Senegal or Gambia. Expeditions were launched, most ending in failure. The Association's 'missionaries' included the Scotsman Mungo Park, a qualified doctor, who famously detailed his accounts of severe hardship, just surviving an attempt at reaching the forbidden city, before turning back at the Niger River near Mopti to return heroically back to the Gambia, malnourished and destitute with only the rags on his back. After establishing a country practice back in Scotland, he couldn't resist the adventurous life and was drawn back for a second visit, only to be killed in Nigeria while attempting to follow the Niger into the Atlantic. Frederick Hornemann, recognising the need to pass as a Muslim to gain access to the area, immersed himself in the North African culture, before setting out to cross the Sahara (possibly reaching Timbuktu) before eventually being killed by the Tuareg. Another famous explorer Jean-Louis Burckhardt too spent years in Egypt and present day Syria, passing himself off as an Afghani Muslim while learning the customs. Travelling extensively in the Middle East  all in preparation for his ultimate goal of being the first European to reach the fabled city - he made the pilgrimage to Mecca, and rediscovered the stone city of Petra in Jordan. Unfortunately he died in Cairo before fulfilling his destiny. 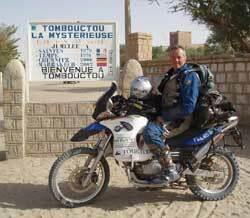 Until the mid nineteenth century, 43 attempted to reach Timbuktu, of whom just four succeeded. And so it was with great satisfaction I arrived with not quite the same adversity to face as others before! And sure enough, the town isn't that impressive visually, seeming slightly run down with not too much activity evident. I enjoyed poking around its mud alleys, and ancient mud built mosques, paying homage at houses where some of the explorers stayed, including Rene Caillie, Gordon Laing and “the” Heinrich Barth. It does have the feel of being a desert outpost, surrounded as it is by sand dunes, which no longer is a vital link with the huge empty geography to the north. And not a town to negotiate with anything other than your feet, the main street is deep sand! The attraction at this time of year was the annual Festival-au-Desert in nearby Essakane, an oasis at the confluence of a number of desert trade routes. 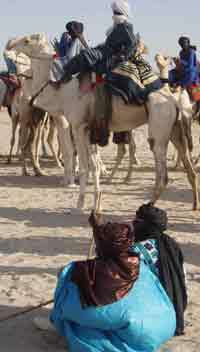 Nomadic Tuareg tribes from throughout the southern Sahara region traditionally gather here once a year to trade, race camels, and generally socialise, look for a wife, widen the gene pool. In recent years, the music program has become a greater focus of the festival, the compulsive rhythms and chants of the music of the desert, and the seductive appeal of Malian music in general attracting a small but growing number of intrepid Western visitors to the event. After four hours of the exciting roller coaster we arrived at the big site in the desert and pitched our tents, and what an occasion it was. Hundreds of magnificently attired Tuaregs draped in striking robes, reclined imposingly high up on their camels, wandered about in small groups, majestically guiding their elegant, swaying camels through the crowds. Turbans obscured all but their eyes adding a touch of mystique to these blue men - so called for the blue dye some applied to their skin - their commanding presence adding an exotic atmosphere to the occasion. The setting in the desert sand dunes gave the whole experience a ”pinch myself, am I really here” feel. And the music, the music. The exhilarating energy of Basekou Kouyate and his troupe of n'gomo players (at times developing an extended, full on, rocking bluegrass groove), the professionalism of Adama Yalomba and the sweet, compulsive sounds of his band (completing his show with an impressive backflip!) to the hypnotic rhythms of the Tuareg bands Terakfat and the more well known Tinariwen, were highlights for me. A three hour tribute to the recently deceased Malian guitar legend Ali Farka Toure, was a feature one evening, with maybe ten or twelve artists coming on to cover the great man's compositions. The kora maestro Toumani Diabate treated us to one unaccompanied, inspired recital; and the star Oumou Sangare, a little overcome with the emotion of the event could only manage a short but affecting lament. The backing band, members of Afel Bocoum's band, was superb. Afel himself, hailed as Ali Farka's musical successor, contributed, as did the guitar hero Baba Salah who lit up the crowd when he came on - a rock god in the making! It was a marvelous evening, and I felt fortunate to have witnessed such a show. In the afternoons, strolling around the dunes, the haunting strains of traditional desert music could be heard. 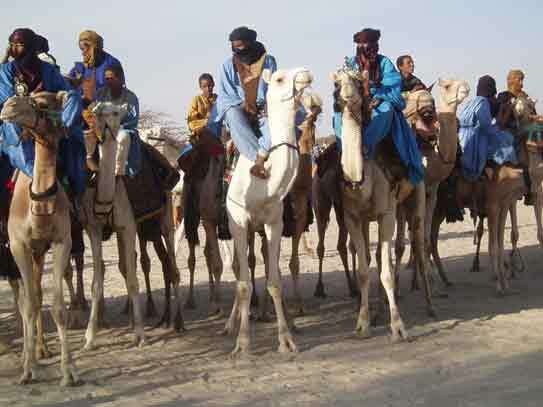 Groups of Tuareg on their camels clustered around a spot would indicate a local band, usually vocally driven with a percussive beat and a string instrument accompanying. Tartit were a great exponent of this. The whole experience was guaranteed to revitalize any jaded music fan, and for me was a tremendous success  I had high expectations for the weekend, and they were exceeded! 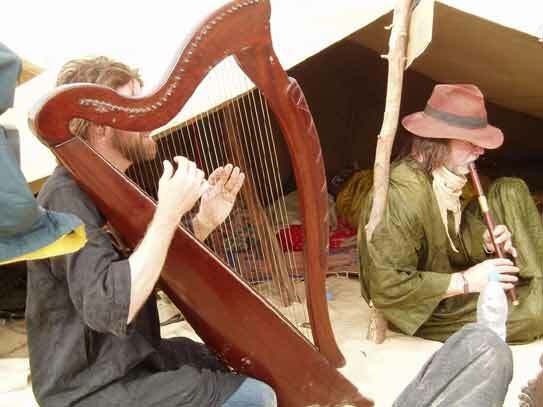 The unreal moment was lying in the warm sand outside a Tuareg tent in the late afternoon, listening to Liam O'Maonlai on harp and Paddy Keenan on low whistle playing with Afel Bocoum and some of his superb musicians. Three days was enough - I was nearly overwhelmed by it all, beaten into submission by that very persuasive Malian rhythm stick! I think the same could be said for PJ&P! 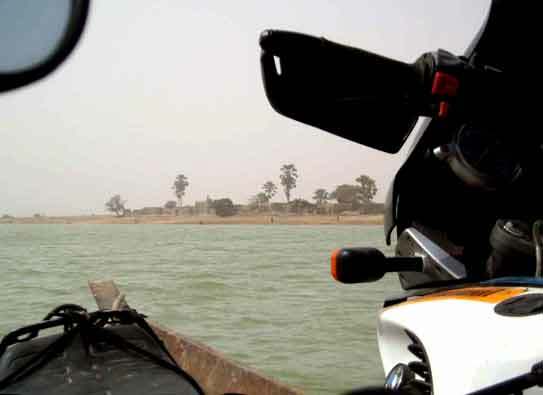 As Timbuktu doesn't have many road options - the same road out again didn't appeal - I bade farewell to the three lads and put the bike on a pinasse, a small local river boat. Sean the Aussie joined me with his bike. (He'd made it to the festival after riding ‘til 11pm the previous night, getting to the ferry the next morning, before hopping onto a 4x4 in time.) 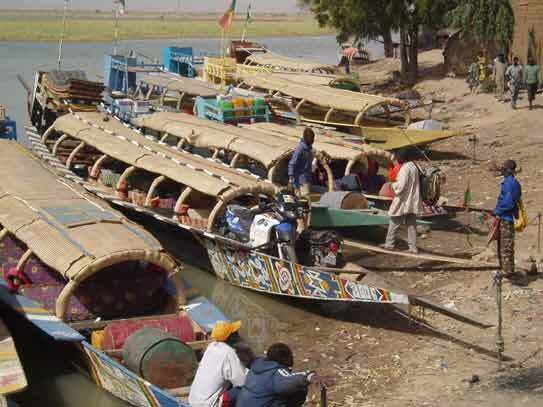 We had negotiated a price of €75 each, including food, and set off with a few other westerners on board for the lazy three day trip upriver to Mopti. It was a strange sight, our two bikes nestled together on the small boat. 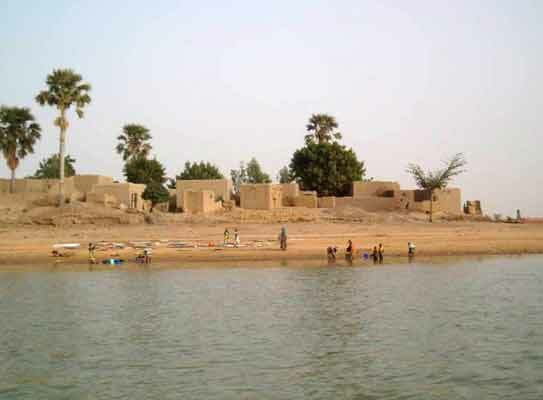 To take a trip along the River Niger in Mali nowadays, I'd read, you will find your boatman speaking at least half a dozen quite distinct languages or dialects in the course of a normal day, including Mandekan, Soninke, Wolof, Fulani and Songhay. Seeing life from the river also allowed a privileged glimpse of the mysterious Bobo people, fishing from small, poled dugouts as they've done for centuries. Chugging down one of the many channels in this inland delta, we would glide past a small collection of huts on a spit or sometimes an island, firewood stacked in a tidy pile on the river bank, smoke rising from cooking fires, little evidence of the twenty first century, until I spotted a 'Fifty Cent' t-shirt on one fisherman! 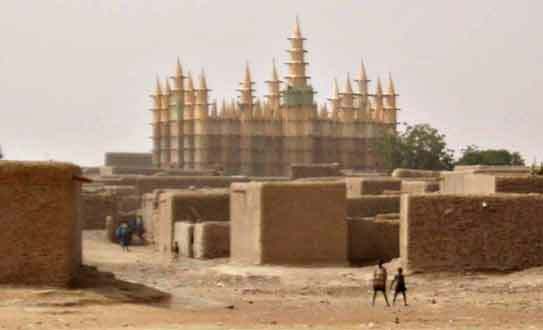 On the three day trip, we passed numerous mud built settlements on the banks, many with small though impressive mosques. Occasionally a public transport boat would pass us coming down river, seriously heavily loaded with goods, sometimes alarmingly low in the water. 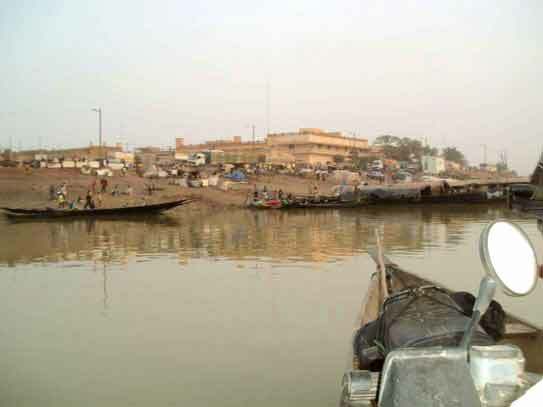 The river communities, cut off from any road access, depended on the river transport for trade and supplies. Also travelling on the pinasse was Damian, an entertaining travel companion, who had a successful world music website www.fly.co.uk. He was keen to pay his tributes to Ali Farka, and so Sean, myself and a Swiss girl who came along to interpret, hopped off the boat promising the 'capitaine' we wouldn't be long, and traipsed up through the dusty, mud town in search of the family home. On the way was the bustling old traditional market enclosed in mud walls, a few acres in area. 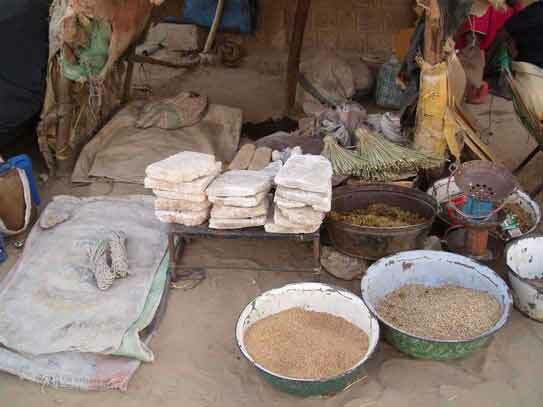 Stalls - shaded with large mango trees, or woven grass mats overhead supported by crumbling, old mud posts - displayed everything a household living on the edge of the Sahara and the river may need to get by. Iron basins of grains and dried pulses, a modest variety of vegetables, small smoked fish fillets splayed out in rows, a table with a recently butchered goat, large tablets of salt, display cases of cassettes, bolts of colourfully designed cotton, plastic kitchenware in bright primary colours, hardware and iron farm implements. On reaching the house, Damian respectfully enquired whether we could enter, and was ushered in, the rest of us tentatively following. We were very sensitive to the fact that the man was less than a year buried and were careful to observe proprieties. 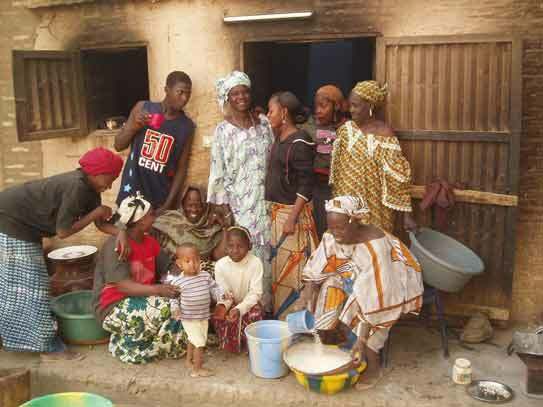 However we were made to feel very welcome in the family compound, introduced to one of his wives (he reputedly had three including a Dutch woman, and had maintained another wife and home here in Niafounke, which is perfectly in order in this culture), his brother's wife  a strikingly noble and handsome looking woman who seemed to hold the authority, and various children and nephews. Though very traditional with all life being lived outside in the dusty courtyard, the dark kitchen a mud built outhouse, the home had a discernible sense of comfort and of comparative wealth. I believe we displayed satisfactory deference, as the family seemed quite comfortable with Damian's questions, and volunteered to show us around, first to an outside room where Ali Farka would rehearse with other musicians, and then in to a lavishly decorated lounge where some of his awards hung, including the Grammy certificate he received with Ry Cooder for the album 'Talking Timbuktu'. 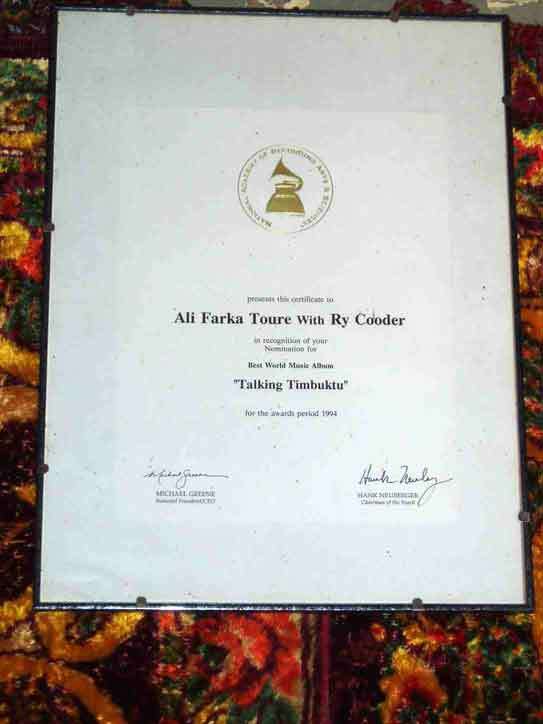 Apparently the statuette for the other Grammy, 'In The Heart of the Moon' with Toumani Diabate was held by a brother. On leaving, the sister-in-law insisted a nephew accompany us to the 'Hotel Ali Farka Toure' close by. This is where the great man recorded his final album 'Niafounke'. After taking the obligatory tour there and buying a crate of beer for the boat, we made it back through the sandy streets to the river shore, finding our pinasse still there! At the fall of evening, we would pull onto a deserted sandy beach and put up our tents for the night. 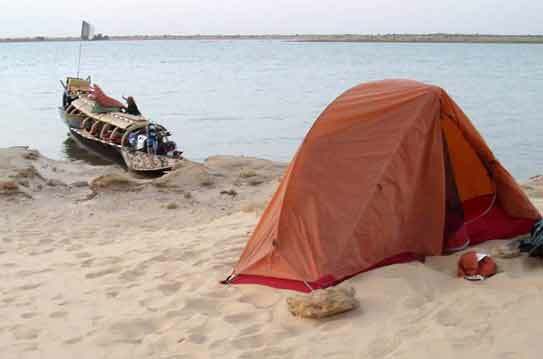 It was lovely to rest on the sand, a fire flickering in the dark, the Niger flowing a few yards away. I was beginning to really get the hang of the enforced idleness of the boat journey. It allowed plenty of time to reflect on and savour the many unforgettable memories from the weekend in Essakane, in fact the whole trip to date, and to contemplate the next stage towards Central Africa.